Edythe Wallach (1909-2001) lived and painted for most of 1944 in Chapala and Ajijic. Her Lake Chapala paintings were exhibited in both Chapala and in New York. About a year after her return to the U.S. she married a fellow artist, Hari Kidd. Edythe (“Edie”) Gertrude Wallach (later Wallach Kidd) was born in New Rochelle, New York, on 10 August 1909 to Dr. William Wallach and his wife Anne Rosenthal. Edythe grew up in New Rochelle which appears to have remained her home at least until the death of her father in 1937. The family, which was Jewish, was clearly well-to-do since the parents were able to spend summer in Europe (with one or both children) every few years, notably in 1926, 1929 and 1933. It is unclear where Edythe acquired her education or art training. Edythe Wallach’s mother died in January 1944. Shortly after that, Edythe left for Lake Chapala, where she lived first in Ajijic for several months and then in Chapala. Wallach was one of several artists mentioned by Neill James in her article “I live in Ajijic”, first published in 1945. By November 1944, Wallach had completed enough paintings to warrant an exhibition at the Villa Montecarlo in Chapala. The local El Informador newspaper in Guadalajara described this as “one of the most brilliant artistic and social events of the Fall”, saying that guests from Ajijic, Guadalajara and Chapala responded warmly to the bright color and lively designs of the paintings which were being transferred later for exhibition in New York. 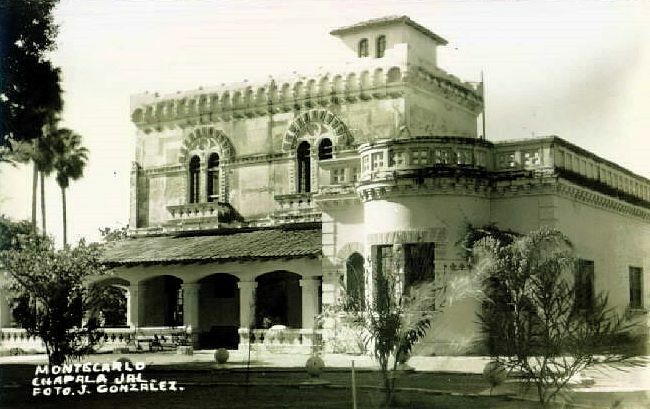 The opening on 12 November 1944 attracted many noteworthy guests, including Mr and Mrs Jack Bennett; Nigel Stansbury Millett and his father; Neill James; Pablo García Hernández (representative of Teatro Mexicano del Arte); Otto Butterlin and his daughter Rita; Witter Bynner, the famous American poet; Charles Stigel; Dr and Mrs Charles Halmos; Ann Medalie; and Herbert and Georgette Johnson. Miss Edythe Wallach… has just returned from a year’s travel in Mexico where she has been painting…. While it remains unclear how, when or where Edythe first met Hari Kidd, their paths must surely have crossed in Chapala in 1944 since Edythe had a solo show at Villa Montecarlo in November while Hari was in a group exhibition there the following month. It is entirely possible that their romance began in Chapala under the soft moonlight reflecting off the serenely beautiful lake! In March 1946, Edythe Wallach and Hari Kidd married in Key West, Florida. Kidd was already a well-known artist and one account of the wedding says that, “The bride, herself an artist of note, recently held her first exhibition of Mexican oils in New York, and is planning a new group of paintings for a forthcoming show.” A similar comment about a forthcoming show appears in The Miami News in September 1946 which says that Edith Wallach, wife of Hari Kidd, “fresh from a painting sojourn in Mexico” is “preparing for a second show in New York of her Mexican interpretations in oils.” I have been unable to confirm whether or not Wallach (presumably with Hari) returned to Mexico in the summer of 1946 (as this piece suggests) or, indeed, to find any further reference to this second U.S. show. Edythe Wallach Kidd. Untitled. Date unknown. Credit: Stephanie Wallach. Both Edythe and Hari Kidd were in a three-person show at the Miami Beach Art Center which opened in January 1948. The third artist was Eugenie Schein of New York. Edythe exhibited oil paintings “favoring Mexican themes” while Hari showed both oils and watercolors. According to the press notice, “Both artists have spent a number of years in Mexico and Spain and their work reflects this influence.” They also participated, with Elvira Reilly, in another three-person show at the Martello Towers Gallery in Key West in January 1954. The couple lived in Key West from about the time they married in 1946 to 1964. Due to Hari’s declining health, they then moved to Tucson in summer 1964, where he died in hospital barely four months later. Edythe remained in Arizona for several years and attended the inauguration of a retrospective of her husband’s art at the El Paso Museum in October 1967. In late 1968 or early 1969, she returned to live once again in Key West, Florida, where she held a show of her work at DePoo’s Island Gallery in 1969. Several years later, one of her paintings was chosen for the juried 13th Annual Major Florida Artists Show which opened in January 1976 at the Harmon Gallery in Naples, Florida. 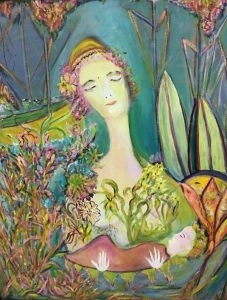 At that time, the artist was listed as “Edythe Wallach (Key West)” but Edythe later moved to Lake Worth, where she passed away on 17 December 2001. My sincere thanks to Edythe Wallach Kidd’s niece, Stephanie Wallach, for helping clarify details of the artist’s life and for kindly supplying the photograph of one of her paintings. Note: This post was significantly updated on 20 October 2018. The Burlington Free Press (Burlington, Vermont), 19 October 1945, pp 16, 20. El Paso Herald Post, Monday, 18 March 1946, p 6; 14 Oct 1967, Showtime, p14; 12 April 1969. El Informador (Guadalajara): 18 November 1944; 3 December 1944, p 11. Neill James. 1945. “I live in Ajijic”, in Modern Mexico, October 1945. The Miami News : 7 September 1946; 25 January 1948, p 59; 31 January 1954, p 24. The Naples Daily News (Naples, Florida), 11 January 1976, p 58. The New Yorker : 10 November 1945. Tucson Daily Citizen (Tucson, Arizona), 19 November 1964, p 7. I am Edythe Wallach’s niece. I may have some of her paintings stored in my basement, although probably not in very good condition. I will look. Also, I’m sure there are photos of some of them somewhere. Again, I will check. Dear Stephanie, Thank you for taking the time to post your comment. This is VERY exciting news for me since I have long wanted to see some of your aunt’s work. I now have my fingers crossed that you can locate some of her paintings or photos of them. The easiest way to send them, please, is as attachments to an email. E-mail address. Stephanie Wallach, Hari was my husband’s uncle. We have a few photos. Do you have any photos of Hari?